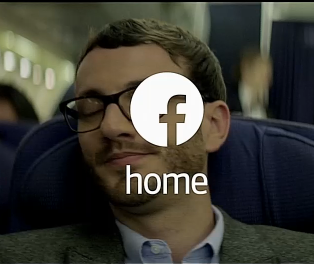 Facebook: First update to 'Home' coming first week of May, while auto-play ads might land on the main site by summer! Today at Dive Into Mobile things were pretty busy, we already know that Google's Andy Rubin and Eric Schmidt have talked about Android's past, present and future, but we couldn't leave Facebook out when they said some pretty interesting stuff too! First up was Facebooks, Cory Ondrejka, who's the head of mobile engineering at the company. He confirmed that the new Android launcher, Facebook Home, will be receiving its first update during "the second week of May." We're not sure if you remember, but at the launch event the guys confirmed that they would be revising the new mobile apps every month, so that first update will arrive right on schedule! Unfortunately Ondrejka didn't say whether this update will apply to just the Facebook phone, the HTC First, or whether it would be on the Play Store too, we assume it'll be both! It was also confirmed that those of us outside of America will be able to download Facebook Home if we have a compatible device, because the app will be rolling out around the world from today! If you've got a couple of spare minutes then the guys over at TheVerge have got a great article about when they got to spend some time at Facebook's campus! If you head over and have a look it's definitely worth checking out the video, which suggests that ChatHeads are coming to iOS, but we doubt that they'll integrate with SMS messages because iOS doesn't have the same openness as Android! The second part of this article concerns Facebook on your computer. You all know and love the site as it is at the moment, but now that Facebook is listed on the stock exchange the guys need to start making a little bit more money off of the vast user base which they've established. With that in mind a rumour from Ad Age becomes a little bit disconcerting. According to the rumour, Facebook is preparing to launch advertising space which on the left and right of the news feed, as well as planning four 15-second automatically starting video ads. These ads will supposedly be split down into four groups that'll target; women over 30, women under 30, men over 30, and men under 30. With ads which give such good access to so many people it's a great way for Facebook to increase revenue and they're reportedly ask for about $1 million per day par age category! That potentially gives Facebook $4 million a day in income, which over the space of a year works out to being $1,460,000,000, so very nearly $1.5 billion! Facebook declined to comment on the rumour, but it wouldn't surprise if something like this happened in the future, but there will naturally be a user backlash! What do you think though? Is this a good idea or not? Let us know in the comments below!